We were faced with another moral dilemma a few weeks back. This seems to be happening a lot lately. Just last weekend I Hoovered up the last of the spider webs that had accumulated over the summer. One was down low, apparentlly abandoned so I vacuumed up the detritus that had collected in it but stopped short when I saw the little spider walk away looking slightly injured but more pissed off than anything. He stomped away on 7 1/2 legs, I swear. I guess those little balls of fluff attached to the web were his little meal packets that were going to feed him for the next few weeks. Boy did I feel guilty about that. But at least we didn’t kill him like we did the others. A few weeks before that we noticed some Yellow-Jacket wasps hanging around the step of our front door. It’s harder to ignore Yellow-Jackets than it is other types of wasps, or bees (I love bees!). They proved this point by stinging T in the leg on our way out. Thankfully the women and children were spared. Nasty little creatures they are, but we figured that they felt threatened as we came and went over the threshold which they had decided would become their new home. We weren’t back for another couple of weeks and in the meantime we made the decision to bring some vile, poisonous spray in order to, let us just say, urge them to move away. Well, when we got back we could see a little lump underneath the sill so T sprayed it and ran away (hey – he was brave enough to get close, unlike moi). There was not much of a reaction to the spray, but then T noticed a low humming sound, car-motor-like, coming from somewhere else. He couldn’t figure it out until he looked up AND SAW THIS!!!!! Holy crap! At the time it was hanging just above his head beside the front door. I guess while we were away they decided they needed a bigger place to live and called all their distant relatives to move into their great big new home. There’s not much in the photo to show the scale of this thing but it’s bigger than a football, smaller than a Volkswagen. Now what were we going to do? The hive was as busy as the Eaton Centre on a Saturday afternoon and was too close to our front door to ignore. I hate killing anything but we decided that to protect ourselves we had to go on the attack. First, we sprayed into the hole. (Let me make something clear here – when I say WE, please understand that I’m never talking about me; if I write about something dangerous, please assume it’s always going to be someone else tackling that problem, not me. If I do something brave and fearless, I will refer to myself in the first person singular, and I will make sure that my readership understands when I can be credited for heroic actions, otherwise it’s almost always T). Then WE ran away, as I stood looking at the scene playing out before me safely on the other side of the window, inside the house. The wasps wouldn’t die. We had to go back into town and buy the foam version which completely covered the hole. It was awful. When it dissipated we could see the wasps staggering out or falling to the ground. During the next couple of days after they were all dead, we’d occasionally see a stray wasp come around, slowly fly inside and then fall out again, dead. We should have bought a tiny roll of yellow Caution Tape to tack over the hole so they’d back off. Eventually we took the Nest of Death down and as you can see, crusted around the opening are a bunch of dead wasps. We killed them. Us. We. 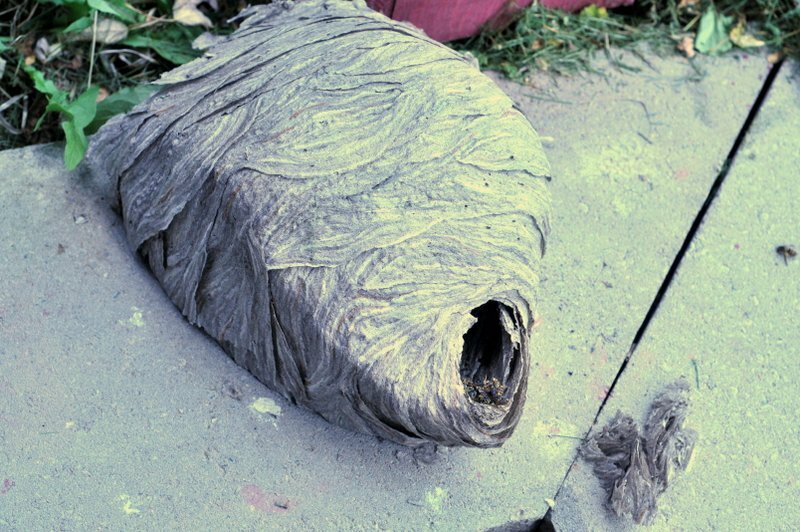 I.
They’ve left us this beautifully intact wasps nest, as you can see here from the other side. Good Karma needed here. If anyone has any extra that they don’t need, please give me a call. 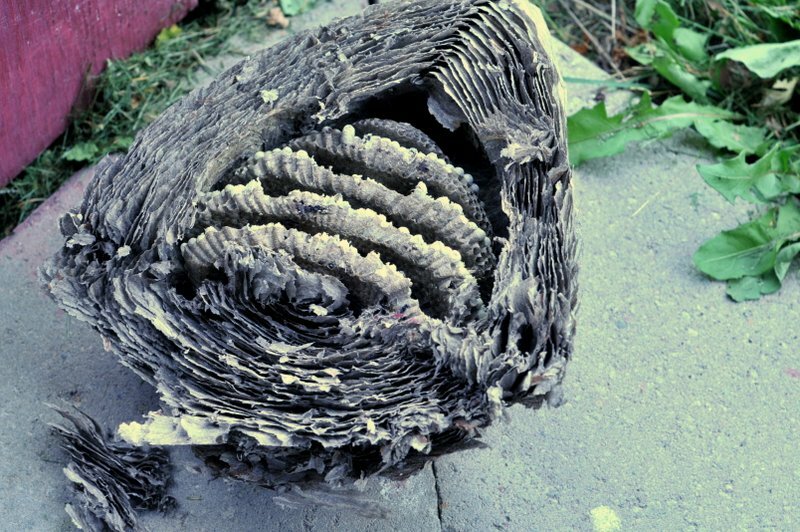 This entry was posted in Animalia, Ramblings and tagged bad karma, wasp nest, wasps, yellow jackets by budbug. Bookmark the permalink.